Preheat oven to 325° F. Line baking pan with parchment paper. In a stand mixer or food processor, blend the almond paste, sugar, and salt until crumbly. Gradually add almond extract, bitter almond oil, and beaten egg whites to the almond paste mixture. Using a small scoop, form cookies and place on prepared baking sheet. 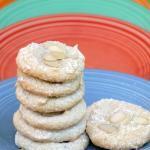 Sprinkle cookies lightly with confectioners' sugar and sliced almonds. Bake for 20 - 25 minutes, until the very edges are just turning golden. Remove from oven and allow to cool.